Having covered all the basic need to know information on quadrialterals, it is time to attempt a couple of questions. The variety of different quadrilaterals are relatively easy to construct once you are given all the information and allowed to use all of your equipment. Therefore the only question i am going to ask is going to restrict you from the use of your set squares. Construct a square given one side - In this question you are given the first line of a square. 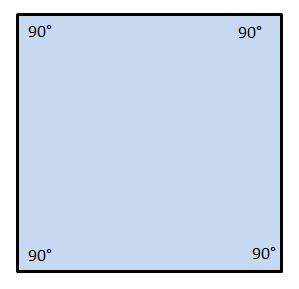 You are not allowed to use your set squares or protractor measure 90°. So the challenge is, how do you draw a line at 90°. Attempt the question yourself first. For a detailed explanation on the principles of the questions and demonstration on how to complete the question follow the link directly below.